If we have no land or space enough to grow vegetables can also grow it in pots, polybags, or other containers. Because the place is small and can be placed in the land, these vegetables can be consumed alone or sold. Sell ​​organic vegetables such as vegetables or plants and their pots or polybags. 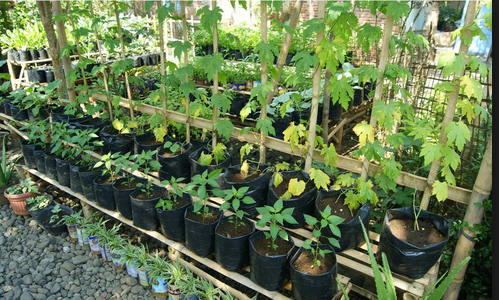 2 Place the nursery a wooden box, polybag, pots, banana leaves or other container with a diameter of 10 cm and container nurseries are not perforated. * To plant tomatoes, peppers, eggplant, and other plants that produced fruit. Maybe, I will to try it.